When drag queens, rock and roll legends, murderous social climbers and tap dancing gangsters come together, it can only mean one thing: the Tony Awards. The biggest night on Broadway made its way to Radio City Music Hall Sunday night to celebrate the best and most unforgettable performances of the season, and while the show had its fair share of historical moments, show-stopping numbers and mind-blowing spectacle, the 2014 Tonys stood out for another reason – they were just plain weird. 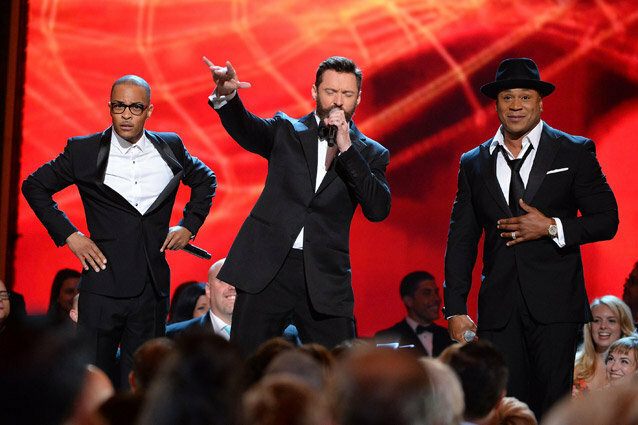 After handing over hosting duties to Harris for the last several years, everyone was expecting Jackman to go big for his return to the Tonys stage. Instead, he went old-school, and spent four minutes hopping around Radio City Music Hall, meeting with all of the actors and checking out all of the shows, in an homage to Bobby Van’s “Take Me to Broadway.” It was a nice tribute to his love of the theater, but for an award show that prides itself on big production numbers and a host who loves a great song-and-dance moment, it was a slightly confusing, slightly underwhelming choice. We’re not sure if the teleprompters weren’t working or if the champagne was just flowing a little too freely backstage, but almost every presenter struggled to get their words out (or, in Fran Drescher’s case, to read the names in the right order). However, no mispronunciations or flubbed cues held a candle to the rambling, confusing speech that Eastwood gave before giving out the directing awards. We think it had something to do with directing, the theater and the importance of remembering your glasses before you head out onstage, but we’d be lying if we said we could follow any of the nonsense he mumbled. Well, technically Hedwig did. During his raucous performance with the rest of the cast of Hedwig and the Angry Inch, Harris took to the audience to make Orlando Bloom take part in a “car wash,” give Sting a lap dance, and make out with his husband David Burtka. Somewhere in there, he decided to steal the glasses of the most intimidating man in the audience, thoroughly clean them with his tongue and the place them delicately back on his face. See that mix of bewilderment, fear, and excitement on Jackson’s face? That’s the only appropriate reaction to have in a situation like that. If you’ve ever listened to a recording of The Music Man and thought that what Harold Hill really needed were some sick beats, we have some good news for you. Over a beat from Questlove, Jackman, T.I. and LL Cool J (because the Tonys air on CBS) freestyled about the hardships of making a living by selling trombones, while the older members of the audience stood there uncomfortably, looking confused and terrified. Look, when your whole show builds to an elaborate, full-contact boxing match complete with an announcer, jumbotron and full-scale ring, you want to show off all of the hard work and preparation that went into putting that number together. Still, would it have killed the Rocky producers to have their leading man Andy Karl sing a few bars? This is the Tony Awards, after all; if we wanted to watch people fight without bursting into song, we’d switch over to Game of Thrones. We’re all for producers using the Tonys to preview some of the shows headed to the Great White Way in the upcoming season, but that doesn’t explain why the number promoting Finding Neverland – a show that won’t open for another year, featuring a performer who isn’t even part of the cast – interrupted the biggest awards of the night and forced the producers of A Gentleman’s Guide to Love and Murder to rush through their Best Musical acceptance speech. Maybe if someone had kept Eastwood on script, Hudson’s diva moment could have come at a more appropriate point in the show. Like as a replacement for whatever dreary song Sting broke out. If nothing else, this year’s Tony Awards were an experiment to see whether a three-hour show could be carried on nothing but Hugh Jackman’s charisma. Most of his bits were a little odd, relying on his good looks and smooth voice to carry him through to the next introduction, as if the whole show were thrown together during his downtime on the X-Men press tour. The fact that everything still worked is a testament to the sheer force of Jackman’s charm, and our willingness to forgive a great deal for a well-executed soft shoe.